At high herbivore density, herbivory can reduce forage abundance, potentially contributing to habitat degradation and driving changes in herbivore population size or range use, in accordance with the exploitation ecosystem hypothesis. 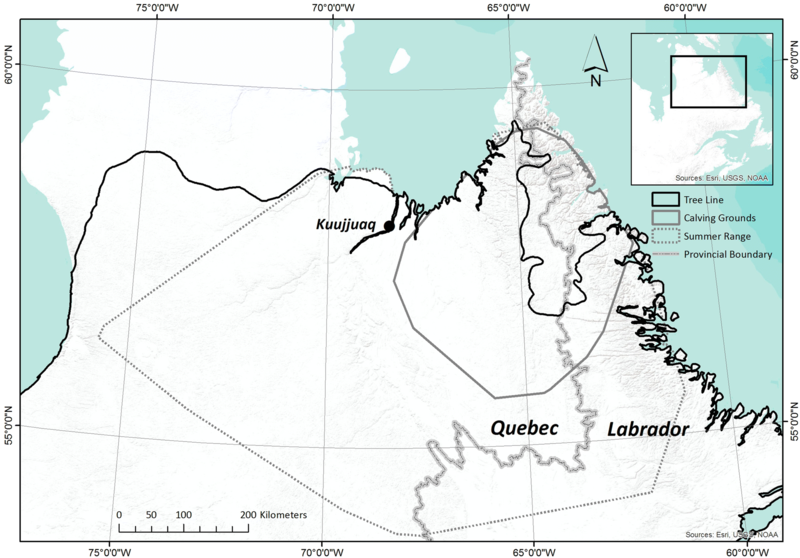 The migratory Rivière-George caribou herd (RGH, Rangifer tarandus) of the Quebec-Labrador Peninsula (Canada) has experienced a large decline in population size since the population peaked in the early 1990s, with similarly large changes in seasonal range use. 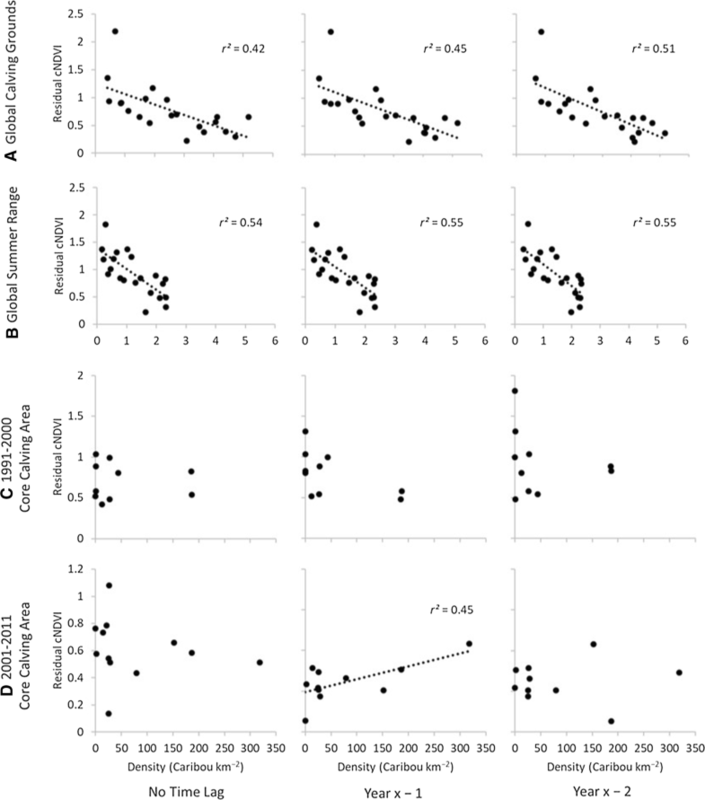 Demographic changes are suspected to have influenced forage abundance and caribou range use through density-dependent interactions between caribou and their habitat. 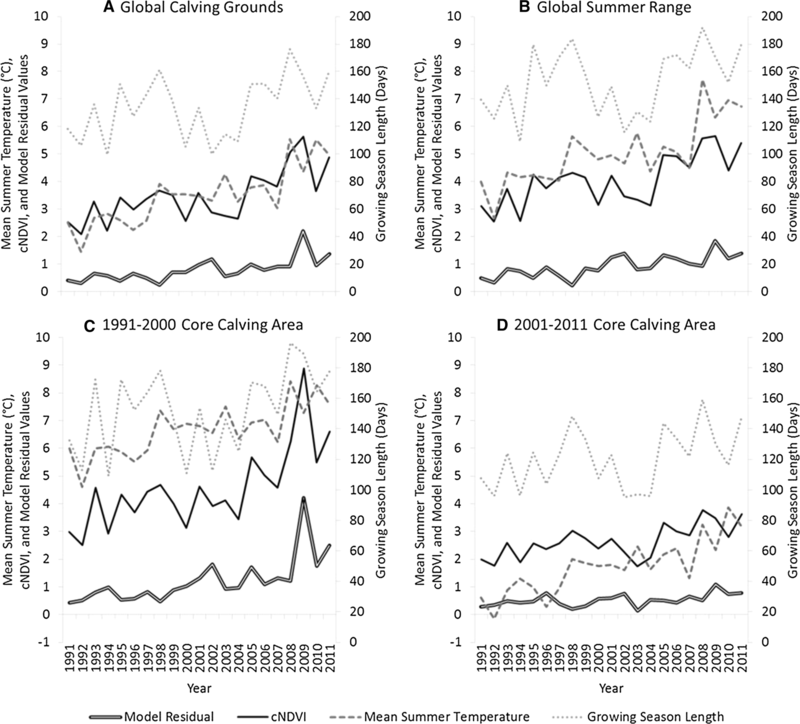 We used the Normalized Difference Vegetation Index (NDVI) to examine relationships between RGH caribou density and range productivity from 1991 to 2011. 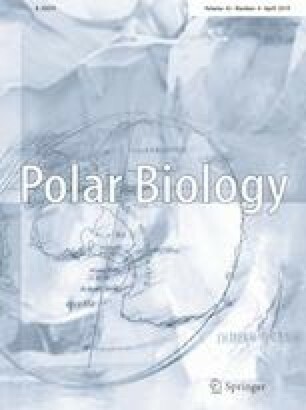 A modelling approach was used to control for the response of climate and to isolate the influence of caribou herbivory on primary productivity. 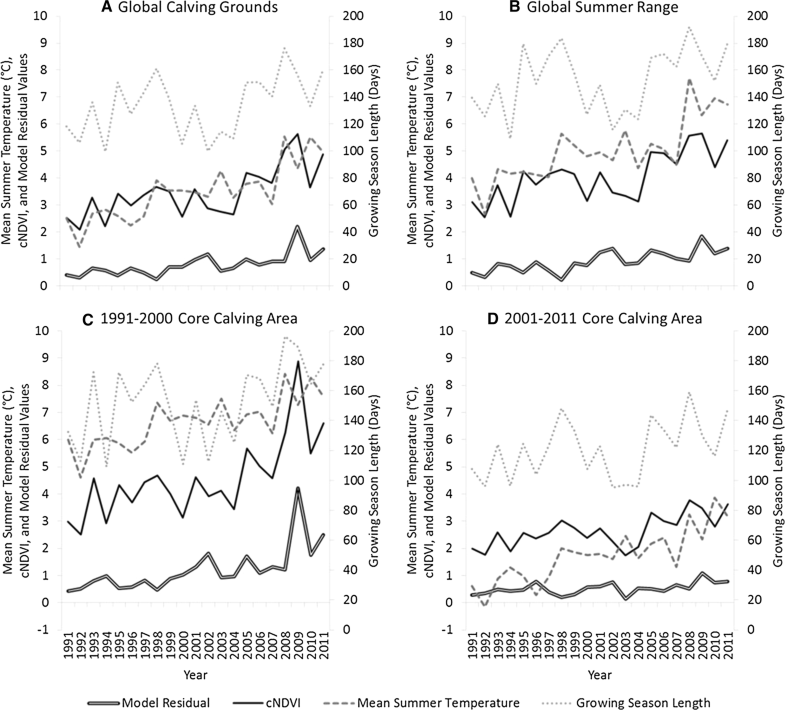 Significant negative relationships were identified between caribou density and primary productivity, after controlling for climatic variation, for the global RGH calving grounds (r2 = 0.54–0.55) and summer range (r2 = 0.42–0.51), but not for the “core” ranges, where caribou density was highest. Positive temporal trends in primary productivity appeared to reflect the decline in RGH population size, suggesting vegetation recovery following reductions in caribou abundance. Climate warming (of up to + 1.5 °C per decade) was most responsible for the strong positive trends in primary productivity observed over the 1991–2011 period, but decreases in RGH herbivory likely also contributed to the increases in range productivity. Forage access likely improved over the study period, which may have influenced RGH range use and habitat selection. We thank the many partners of Caribou Ungava, especially The Natural Sciences and Engineering Research Council of Canada (NSERC) and the Quebec and Newfoundland-Labrador governments, for generously contributing to our work. We are especially appreciative of contributions made by M. Le Corre to the manuscript. We also thank M. Leblond and A. Panagakis for their comments on an early draft. 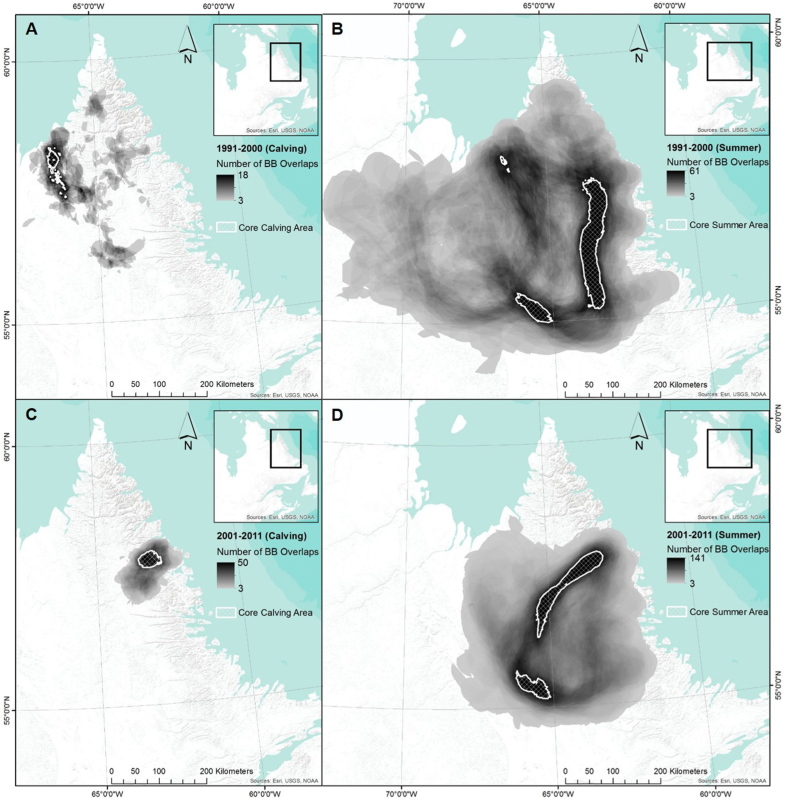 Finally, we wish to thank all members of Caribou Ungava and the UBC Integrated Remote Sensing Studio (IRSS) who offered their assistance during the development of this paper. The long-term datasets used in this study could not have been collected without the technical expertise and continued financial support of these organisations and our other partners: ArcticNet; Fonds de recherche sur la nature et les technologies du Québec; Hydro Québec; La Fédération des pourvoiries du Québec; La Fédération québécoise des chasseurs et pêcheurs; First Air; Makivik Corporation; The CircumArctic Rangifer Monitoring and Assessment (CARMA) Network; International Polar Year; Canada Foundation for Innovation; Institute for Environmental Monitoring and Research; La Fondation de la faune du Québec; Ouranos; Canadian Wildlife Federation; Azimut Exploration; La Conférence régionale des élus de la Baie-James; Le Fonds vert du Québec; Tata Steel; Mine Raglan: Une compagnie Glencore; The Torngat Wildlife, Plants & Fisheries Secretariat; Air Inuit; The Grand Council of the Crees; Redevances Aurifères Osisko Ltée. All animals were used in compliance with ethical and animal care standards, and the minimum number of animals necessary for a large-scale telemetry programme were used. See Tables 1, 2, 3, 4, Figs. 1, 2, 3, 4, 5 and 6. Pinheiro J, Bates D, DebRoy S, Sarkar D, R Core Team (2014) nlme: linear and nonlinear mixed effects models. R package version 3.1-117. https://CRAN.R-project.org/package=nlme.